Classic looks for with any window with Northbranch 72-inch - 144-inch 1-inch Urn Single Rod Set in Antique Silver Finish. Functionality and elegance unite with durable construction that ensures long-lasting use and the rich finish complements any room design. Either attaches panels using the rod pockets or purchase matching rings for easy clip on panels. Upgrade you window with the Northbranch hardware that will never go out of style. Extend the enjoyment of your outdoor space with this 4-season solarium. The Add-a-Room Solarium is constructed from aluminium and features a reinforced roof, two sliding doors and 5-position wind panels. Forget worrying about exposure to rain, snow or harmful UV rays, with this all season solarium enjoying barbeques, parties and outdoor spa days has never been easier. Beautiful and comfortable describe this notched bed. Featured in soft velvet upholstery and constructed with plush foam padding, this bed is a signature piece to any room. Mattress and box spring required. Easy assembly required. Manufactured in Illinois. Every Skyline Furniture piece is custom-made to order. Deerfield All-Weather Wicker Patio Day Bed with Blue Cushions Read a book, relax by the pool or enjoy some beautiful sunshine on this comfy Deerfield Wicker Patio Daybed. The retractable canopy keeps shading to your liking and the ability to sprawl out will put you at ease. 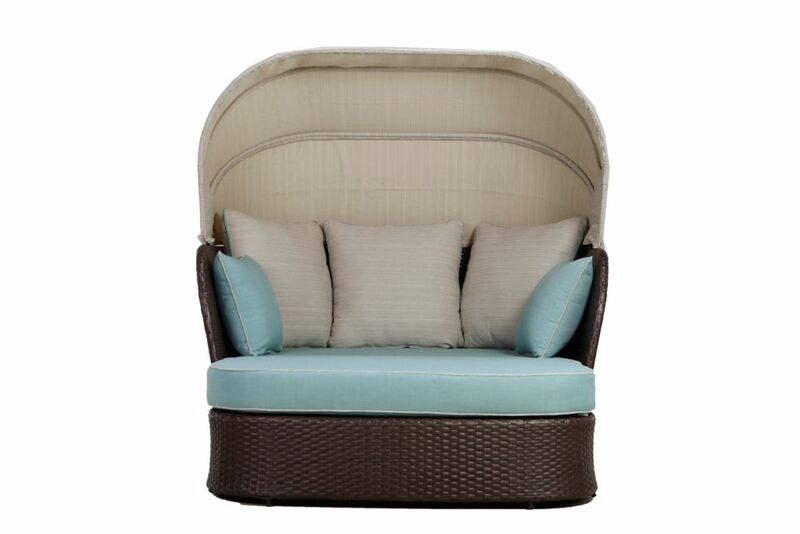 It is durable and attractive, with heavy duty steel framing, a brown resin wicker shell and weather-resistant blue/beige olefin cushions. Deerfield All-Weather Wicker Patio Day Bed with Blue Cushions is rated 4.6 out of 5 by 66. Rated 4 out of 5 by Necjan from Really nice design. Love the canopy, and the color of... Really nice design. Love the canopy, and the color of the cushions. However, the little finishing nails are falling off and unraveling the the weaving at the feet and on edges. Although this not affect the overall structure, this should not happen. Rated 5 out of 5 by Vegasbabe from Love it! Great 4 price! Bought this for my balcony could b little more softer but it is 4 outside! Otherwise love it!! Looks great on my balcony!! It is big so took apart and took slidding glass doors off to fit . It all wrked out! My baby and yorkie love it!! Rated 4 out of 5 by nelly from Very sturdy. Cushions are comfy. Comes in 2 pcs as shown but would not fit thru our front door wh... Very sturdy. Cushions are comfy. Comes in 2 pcs as shown but would not fit thru our front door which is 36" wide. Even if we managed to get it thru that it would not fit out the sliding glass door (which is a smaller opening) to the deck. We had to hoist it with a rope up on to the 2nd story deck. It would be nice if it had a furniture cover option for purchase. Rated 5 out of 5 by Cynthia from Love it!! It's pretty and super comfortable. My sister just... Love it!! It's pretty and super comfortable. My sister just visited for a long weekend and spent hours in it looking at the scenery beyond my deck telling me she was in heaven. A few people allude to the fact that the box for this product is large and may not fit through a door. Could I please ask for the dimensions of the box? I live in a condo and this is for the balcony. I want to mKe sure I can get it there. Hello. Does it include stool and cusion as well? Thanks. Can I leave this out over winter with a cover?